Badger's Plumbing does much more than clean sewer lines. 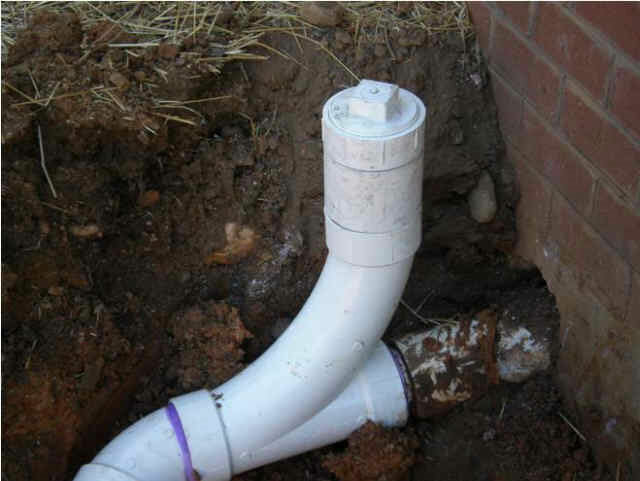 We offer complete sewer line repair and complete sewer line replacement services. Kitchen drains can clog over time. As grease, soap, and dish soap detergents accumulate within the drains it can lead to a complete clog. Badger's Plumbing can clean the drain and restore it to a like new condition. If problems persist with a drain we can do a complete video inspection to accurately pinpoint and locate the source of the trouble. We will inspect all of the drain components under the kitchen sink to ensure everything is working properly. Leaking basket strainers, garbage disposers, and p-traps are often found when the drain is clogged. 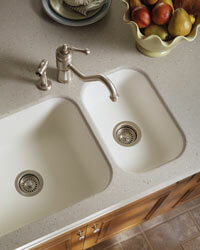 This leads to leaks under the sink that damage the base of your cabinet and often cause the cabinet to "swell". We will recommend repairs as needed to protect the value of your home. Tub & Shower drains are usually clogged by large amounts of hair, soaps, and even the odd chance of a shampoo bottle or toothpaste cap. If you shower and find yourself standing in water this is a good sign that your drain is running slow and will eventually completely clog. If you find "dirty" or "smelly" water in your tub or shower there is a good chance you have a clog somewhere else in the system causing it to back up. Being one of the lowest drain openings in your home this is where evidence of a main line clog will appear first. If this is the case please call us immediately. We will locate the source of the problem and clear the clog restoring your drain to it's original condition. Bathroom sink drains can become clogged by a variety of things. Hair, soaps, toothpaste and foreign objects are all likely to slow down your bathroom sink drain, or, block it completely. A quick inspection will determine if the source of the problem is only in the waste lines under the sink, or further down the line. Either way you can count on us to get the job done right the first time. Toilet clogs are probably the most common and annoying problems a homeowner can face. Often clogged with paper or a foreign object, clearing this type of clog is easily solved. In the event your clog is due to a defective or malfunctioning toilet we will thoroughly diagnose your problem and recommend the best solution. Floor drains are common in basements, laundry rooms and garages. They may also be found on patios and driveways as well as older bathrooms. These drains are equipped with a trap that should be kept filled with water to prevent odors and sewer gas from escaping. Test drains occasionally to make sure they are aren't clogged and are ready to carry away water and prevent flooding. Main sewer lines connect all of the smaller drain lines under your home. The sewer main runs from the home to a septic system or to a city sewer line. Outside of the house where the sewer exits the building there should be a "clean-out" to clean the building drain and sewer. If you are unsure of where this clean-out is, we are able to locate it and mark it's location for you for future use. Roots can enter the building's sewer line through cracked pipes or incorrectly installed fittings. A video inspection can help to determine the source of the roots if they are found during cleaning. If the main sewer line clogs, toilets and drains throughout your house will begin to backup. Often times shower floors and bathtubs will fill with "dirty" water.